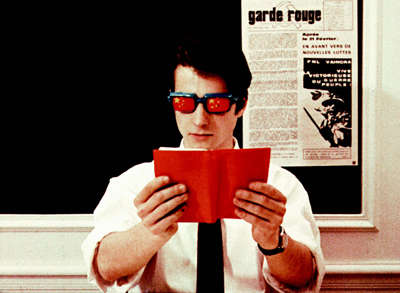 Jean-Luc Godard, La Chinoise, 1967, still from a color film in 35 mm, 96 minutes. Guillaume (Jean-Pierre Léaud). © 2008 Koch Lorber Films. Image scan courtesy of the University of California, Berkeley Art Museum and Pacific Film Archive. Special thanks to Hedi El Kholti. WHY MAY 1968? The risks attending any real attempt to consider anew the significance of the events that took place worldwide during that monthor even merely to honor their anniversary now, forty years laterwould seem prohibitive. Certainly, to address that historical moment’s ideas and actions in all their complexity and specificity would require far more than a single issue of an art magazine: Whole compendiums of studies from a wide variety of disciplinary vantages, sociological and economic, anthropological and artistic, would be needed. Yet therein rests, perhaps, an even greater obstacle: So much has already been said about May ’68indeed, so much will be saidpro and con, in both scholarly and popular discourse, that its fundamental realities and true legacies are, paradoxically enough, somewhat obscure to most. And so, in approaching these events today, one is inevitably in jeopardy of addressing not the events of 1968 so much as the stories already spun about them; and, given the dominant language of reductive narratives, one is also in jeopardy of idealizing (or belittling) the events’ very image and form, of either succumbing to vapid nostalgia or dismissing the time as the stuff of myth. Artforum’s goals in reinvestigating the dynamics of May ’68 are, therefore, purposefully reflexive, intending less to pin down, in any definitive way, the episodes of decades past than to discern their lingering, albeit altered, inscription within circumstances now. Nearly every text in the current issue looks at May 1968 specifically in historical counterpoint, operating in a comparative and genealogical mode that brings the questions of ’68 to bear on today. To give an example that speaks to the contemporary art context: When independent scholar Sally Shafto writes of the Zanzibar group’s intermingling of leftist politics and cinematic dandyismand attributes a “destabilizing potential” to their contradictory mixone is bound to think as well of similar film- and video-making collectives working now and to wonder whether the potential of such seeming contradiction in culture remains the same. Or, to speak in terms of society more generally: Architecture and urbanism theorist Tom McDonough looks again at Henri Lefebvre’s account of May ’68in the sociologist’s recently republished book The Explosionin order to better grasp the metropolitan conditions that set the stage for the 2005 riots in the Parisian banlieues. Yet the matters examined here are, perhaps, most pregnant in their implications when pertaining to society and the figuring of art within it. For throughout these pages, essayists repeatedly underline the ways in which the very creative models and concepts that propelled ’68from the flexible, structuralist thought underlying institutional critique (Buchloh) to the pedagogical endeavors presenting viable alternatives to social bureaucratization (Holert); from principles of individual autonomy steeped in aestheticism (Atkinson) to applied ideas of difference (Gillick)are now threads in the vast fabric of commerce and industry. Regardless of whether these observations provide a measure of the success of May’s enragés or of their appeasement, they underline art’s increased role within the economies of culture more generallysuch that our definition of what art is should likely be revisited. The potential significance is clear enough. As political philosopher Antonio Negri says in conversation with Sylvère Lotringer, speaking about the aftermath of ’68: “It was clear that the relation between work and daily activity had become more intimate.” It is with such refrains in mind that the current issue suggests itself to be a sequel, or coda, to Artforum’s consideration last month of “Art and Its Markets,” and that lessons for today become apparent even as one reads the stories of May ’68 in the spirit of their own time.